Click here to buy a digital download of the full movie! 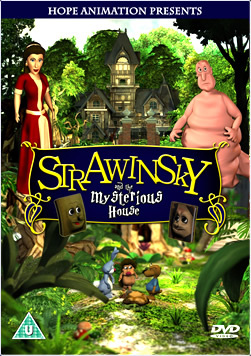 “Strawinsky and the mysterious house” is a half hour animated movie that was created by David Hutter. It tells the story of four talking animals that discover a hidden mansion in the middle of a secret forest. They start exploring the house and encounter strange inhabitants such as a depressed cello, a manic troll and an overweight creature that is addicted to the books in its basement. As Strawinsky – the hero of the story – tries to solve the mysteries surrounding the house, his friends get trapped in the underground library. It’s up to Strawinsky to find a way to break the dark spell and help his friends to escape from the evil lurking within the mysterious house. Sign up to our free newsletter to get monthly updates about our latest projects!